The primary aim of these centers is to provide the food to the starving poor guys. We provide food to almost all 400 people every day with our dedicated team members that are always ready for the service of humanity. You can also do your bit by helping us in our initiative. For opening a Roti-Bank in your area, you can contact us. Our aim is to open a Roti- Bank in every street of Delhi that can cater food to the destitute. 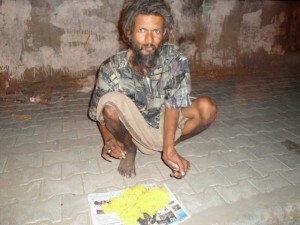 We aim to provide meals to all the poor and needy people in the city. We believe in the fact that best way to serve the god is by serving the humanity and we are leaving no stone upturned to feed the starving people of Delhi. The Roti Bank in Uttar Pradesh caters food to 400 peoples of the Bundelkhand region. Currently, they have started operations in the various districts of the Bundelkhand area where thet provide meals to the destitute. We have aspiration to set-up Roti- Banks in all districts of Uttar Pradesh that will guarantee all the poor peoples of the state the right to meal and help then satiate their quench. We have a team of 45 committed individuals who give it their all to provide basic meals to at least 400 peoples in a day. Our volunteer collect food from the houses in different localities of state and from that collected food only we provide meals to starving people. We don’t discriminate anyone on the basis of caste, creed or color and in our branches we cater food to everyone without asking for their religion or caste. Roti-Bank in Mahoba is first of its type. We are a group of hard-working and committed individuals that are dedicated towards this social cause. With the help of our team, we currently provide food to nearly 400 people every day. Our volunteers collect food from the homes in the city. With the help of the food that we collect, we prepare meals for poor and feed them regularly. In our organization, we cater meals to people from all religions and sects without any discrimination. Any starved or poor can come to us and we will offer them with meals. You can also help us in our initiative by making your contribution. You can provide us with food or money that we will use to serve the needy people. For more, visit the city office of Roti-Bank in Mahoba. The Roti bank was set up as an experiment by the four youngsters of Aurangabad to help the poor and save them from starvation. They collected two Rotis from each house in their area and with the collected food they served for the starving. But as we say, Goodness is fuel that keeps on running, in the same way this effort has now spread in all the cities of India. People from all the regions are doing their bit through this Roti-Bank campaign to save people from starvation. Mumbai dabbawalas have made great contribution to the Roti bank, they ask for the people to provide extra Rotis when they pack dabbas for their dear ones. They all collect those extra rotis and use them to save people from the starvation. This helps a substantial number of poor people to get food for them. The best thing about the Roti banks is that it believes in serving the starving people without asking for their caste or religion. The Roti Bank believes in serving the humanity above all the self-made differences based on religion, creed, color or the region.